1st: 2-1-3-4-5…Shivoo (2) was bet down to near even-money in career debut in NY. Since returned to KY and has worked lights out at Keeneland for a guru of 2YOs. Have to prime on top here with the others. I bet the 2 to win only (short odds expected) and key over the numbers. I cover with a small “all” / 2 exacta. 2nd: 4-2-3-1…Angelo’s Ashes (4) is coming off an extended stay on the sidelines, and pedigree may ask for more grass. But this is not the toughest field around and the barn does well with one switching trainers. Modest drop down in class certainly doesn’t hurt. Right on By (2) gets her third career start for a barn who likes to take their time. Could be ready today. Distortress (3) is well-bred and comes off an extremely wide / tough trip. Can’t dismiss. I bet the 4 to win/place and box 4-2-3 in one exacta and the 4-2-1 in another. 3rd: 2-5-6…Not a good betting race for me, but I finally land on Irish You Well (2). Takes a career plunge in class and that may shake this one up to the winner’s circle, or indicate that the 6YO has seen better days. Ironclad (5) has never won at Churchill, despite his chances before, and Allidoisdreamofyou (6) moves up after the scratch of the 4. Another class dropper. Tepid wagering for me, with win/place on the 2 and small 2-5-6 exacta box. 4th: 1-6-4-5…Another one that I struggled to find anything to really zero in on. Finally gave a slight nod to Shamelessfi (1), who missed in the last out and looks to be improving some. I bet the 1 to win/place and wheel over/under the other numbers. 5th: 4-3-2…Small field will hold down the betting here and makes the pace even more important. Despite any real sense of speed in here, I go to a deep, deep closer in Irish-bred What’s In a Kiss (4). Just think she is the best quality. Sister Blues (3) goes for a hot trainer and is another closer. Corby (2) may be a pace presence, but gets one of the coldest riders in the country. I bet the 4 to win/place fairly strong here and key over the other two strongest with a tiny “all”/4 exacta to cover. 6th: 4-2-7…Ultra Arumba (4) hasn’t hit the board this year in three starts and has been double-digit odds in the last four. But this Brazilian mare drops in class significantly today and gets my tepid pick. Yooou Den (2) goes for one of the best claiming owners around and has to figure in the top two here. Little Ariel (7) was claimed two back for Joe Sharp and may warrant some interest. I bet the 4 to win/place and box 4-2 exacta. I also play a 4-2 over/under the 7 lightly. 7th: 9-8-1-5-4-3-2-7…Nice betting race here. I go with High Multiple (9) in this spot, despite an apprentice jockey who has had his troubles getting to the winner’s circle. Still, this one ran a solid race against Dunk a Din in the last and that one came back to run a huge race this week at CD. The addition of blinkers has sharpened this one up considerably. Young American (8) may have been a winner in his last if not for some serious traffic issues. This deep closer may only need a decent trip to score, and gets a huge bump up in jocks today. Trinitas Soldier (1) is an interesting one here, and could run a good one with the drop in class. I bet the 9 to win/place/show and then box in the exactas with 9-8-1 and 9-8-5. Small key exacta with 9 over/under the rest of the numbers. 8th: 1-9-2-12-11-8-7…Finally, I get to my first “dot” (must use) horse of the day. Souper Fly Over (1) gets to run, while his stablemat and other part of the entry stays home. But that is a good sign here. This one caught a soupy track here in the last and didn’t appear to like it. Ran very well against TOP competition in the first two. Anything close to those performances makes this son of Ghostzapper a winner today, IMO. I like Teletap (9), too, and have been watching for his return to the races. Lot of talent here and could be tough in this spot, as well. Unk (2) is coming off a massive layoff, and, during his stay away, was gelded. Going for a hot barn and, perhaps, with some odds attached. I bet the 1 to win/place and key over/under all the rest of the numbers. 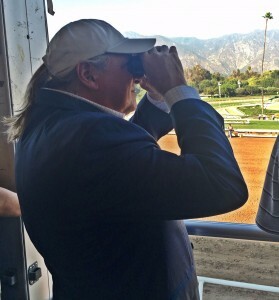 But I also use a 1-9-2 exacta box, just in Casse (figure it out; pun is intended). 9th: 4-2-6-1-3/7…Sonic Boom (4) caught a G3 field in last and despite the comment in the DRF (“caved” – which is way too harsh), I go here. I think the son of More Than Ready got caught too close to the lead that day, on a very soft turf and that took too much away for the close. Big effort, IMO, today. Bet of the day for me. Royal By Nature (2) goes for Brad Cox and he is always tough. This one ran a big one at Keeneland last fall. Thirstforlife (6) is not really bred for the grass and I think will definitely be over-bet in this spot today – considering the types he has run against. But Casse is always tough, too. My Best Bet of the Day goes on the 4 to win/place and key over/under all the rest of the numbers above. I also hit it one time with the “all button” on top/bottom in the exactas. 10th: 6-1-4-5-2-11…Awesome Saturday (6) is 5-2 ML odds and will go south of that, IMO. Again, the best of the bunch if he runs his best race back. Stretched out and got an off-going in the last and nearly ran away with it all. May not be so easy today, though, as I can find at least two more speedsters and two more stalkers for this one. May just sit up nicely for a score from off the pace – at some odds. Our Stormin Norman (4) has been on the front end in the past, but may be a little more patient today. First time gelding has trained super since his last race, too. He lost to Awesome Saturday in his last out, but you can already see the one “equipment change” and Norm had some trouble on the turn in that one, too. My true deep closer today, though, is One of a Kind (4). The addition of blinkers has made this one legit and he beat Teletap two back. Watch out. You have to like the 6 in this spot today and make him the top pick in any handicapping circle, but I’m not so sure that he gets the job done today. I am betting the 4 across the board at 8-1 ML and then wheeling him over and under all the numbers above. I bet one exacta box of 6-1-4. 10th: 8-9-2-3-10-7…The top three here are better than the rest, IMO, but it is a wide open race. The class drop should make Dame Fortune (8) a winner today, but you never know. I bet the 8 to win/place and box the 8-9-2 and the 8-9-3 in exactas. I play a small over/under exacta with 8 and all the numbers.